A Farm or Server Farm is a group of servers that share the same administrative tools and are part of the same organization or group. It can be done (web/datababase/index etc) on a single server in “Simple Installation” mode in which case you don’t need a NLB. For many small businesses this is plenty enough. 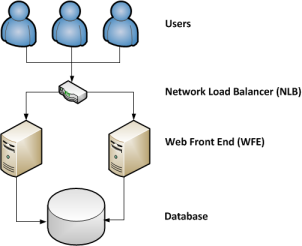 Medium sized businesses usually start with at least 2 Web Front Ends (WFE’s) and a database server. Multinationals can have some very complex setups involving dozens of components.